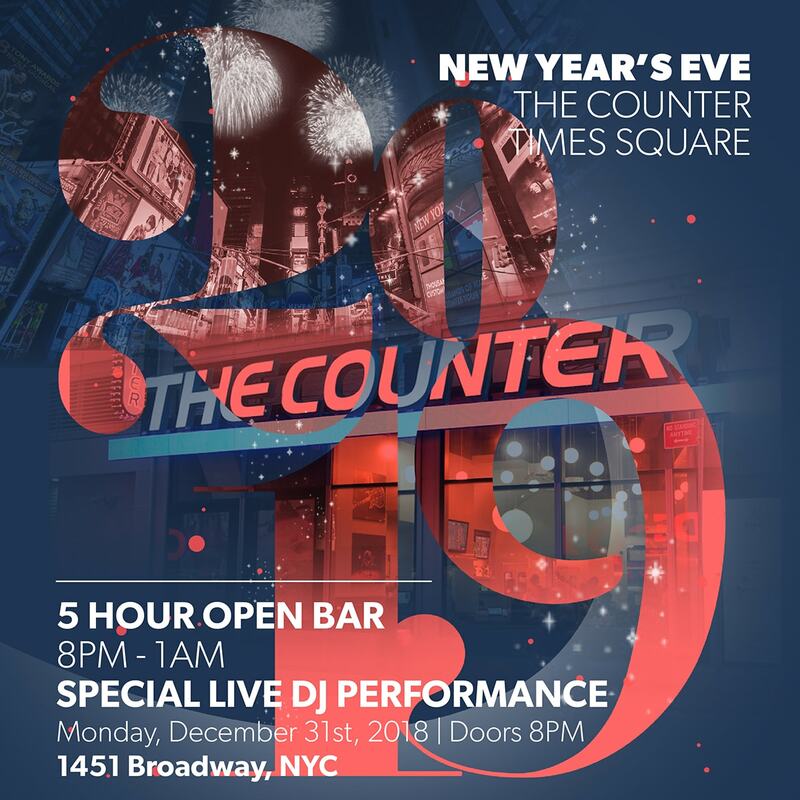 This New Year’s Eve, The Counter - Times Square New York City’s best custom-built burger joint – is throwing a rocking party for you and your family, located steps from the Ball Drop. Comfortably situated inside The Counter yet surrounded by the electric energy of prime Times Square on NYE, you can enjoy a family-focused, fun-packed night of great food, better company, and amazing Times Square action. Known for their scrumptious burgers and fries, The Counter is a unique all-American burger experience in New York City’s famous Times Square. This NYE, the acclaimed eatery has a night of well-done, family-friendly revelry prepared for you. At this super fun and casual NYE celebration, you’ll have the chance to please your palates for taste -and fun- while hanging out in the middle of the action. For the 21 and older crowd, The Counter offers a 5 hour premium open bar and bottomless non-alcoholic beverages for the younger celebrants. Guests of all ages can grub on The Counter’s mouth-watering gourmet sliders and fries and satiate their taste buds in the early part of the evening, compliments of The Counter. The fun doesn’t stop there: ramp up the party with a live DJ performance of the most exciting Top 40, Hip Hop, House, hits that will get you in the highest holiday mood. And at midnight, join other New Year’s Eve revelers in an exciting countdown and top it all off with a toast of complimentary champagne for the adults and apple cider for the youngin’s. Revel in the warmth and comfort of The Counter as you watch the Ball Drop from The Counter’s flat screen TV or a Times Square jumbo screen that’s almost right outside the windows. Want more? The Counter also offers VIP options with exclusive reserved seating. NYC’s The Counter is a first-rate burger spot that offers a modern yet casual dining experience in Times Square, the center of all the fun NYE-action. A perfect hang-out or celebration destination for friends, groups and families alike, The Counter boasts a lively NYC vibe with its snazzy light, black-and-white photos, and wraparound floor-to-ceiling windows displaying all the hustle and bustle outside. A classy ambiance enhances the otherwise down-to-earth eatery making The Counter a delicious and party destination for this NYE. This New Year’s Eve, get front-row seats to Times Square NYE revelry at The Counter’s all-ages bash. Take part in this delicious celebration bolstered by the energy of Times Square and so much family fun. There’s no better place to be this New Year’s than The Counter.